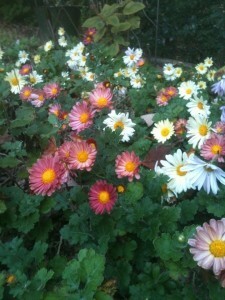 Perennial chrysanthemums benefit from being cut back once or twice or they tend to get lanky with fewer blooms. May and June are key months to keep an eye on your perennials as they’re coming up and (hopefully) growing like gangbusters. A few tasks to do now involve some summer perennials and many of your late blooming fall plants. Of course, the following tips are not something you have to do, but are only suggestions gleaned from my gardening experiences through the years. Remember, gardening is not one-size-fits-all! Perennial sunflower – just about to be cut back in late May. 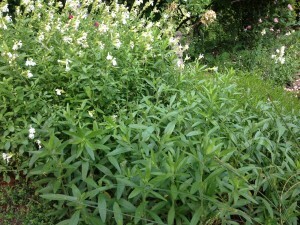 Asters in front of Texas sage in late May after their first cut-back. Hedge shears do a great job quickly! For more blooms on your late blooming perennial sunflowers, salvias, asters, Joe pye weed and chrysanthemums, now is the perfect time to get in the garden and cut them back – if you have large areas, use a hedge clipper and cut them back by half. 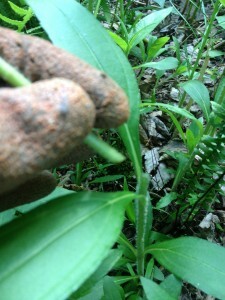 (Hedge clippers – the old fashioned manual ones – work best on asters and perennial mums.) When you cut a stem, it will respond by creating two stems, so you’ll have a fuller, shorter plant with more flowers later. 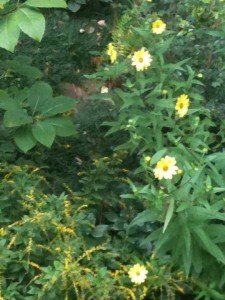 Perennial sunflower getting cut back. 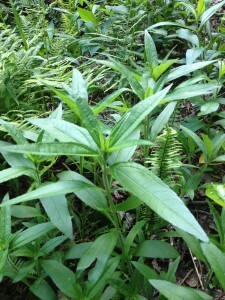 It will create two stems here – more blooms! Now you don’t have to do this, (I’m not the garden police!) 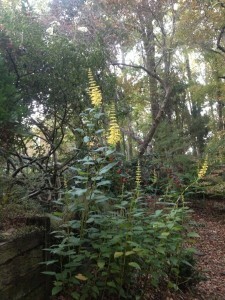 and, if you don’t, they’ll just be taller and bloom earlier in the fall, growing to their full height in your garden. I do like cutting mine back now though. I also make a second cut-back on half the clumps about a month later. This effectively “staggers” the bloom time – those not cut back this second time will bloom first, and be a bit taller, and the plants that are cut back the second time will bloom a bit later. More blooms, longer! It’s a win win! Many southern gardeners say “Don’t cut late blooming perennials back after July 4th”. Rule breaker that I am, I have cut perennial mums, asters and sunflowers back as late as mid-July and had no ill-effect. But I like extending my blooms well into fall – it’s one of my favorite times of the year! Above all, enjoy your garden – after all, that’s what you planted it for, right? Hopefully by following these tips you’ll be able to enjoy it even longer! ***One of my absolute favorite reference books on perennial gardening is The Well-Tended Perennial Garden by my friend, Tracy DiSabato-Aust. If you enjoy perennials and gardening, this is a must have!!! This entry was posted in Fall, Flowers, Perennials, Planting Tips, Summer, Uncategorized and tagged asters, cutting back perennials, fall perennials, garden tips, perennial information, perennial maintenance, perennials chrysanthemums, perennials sunflowers, salvia, summer phlox, Tracy DiSabato-Aust on May 17, 2013 by Kris Blevons.